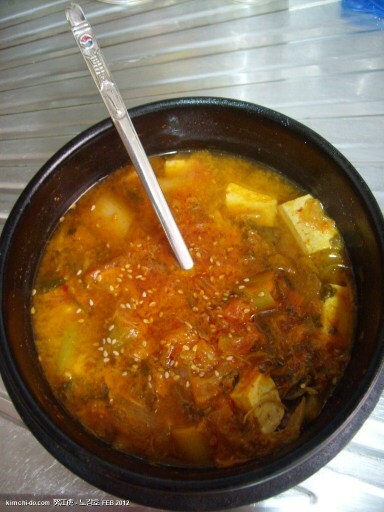 Kimchi Jjigae is one of the most common dishes on the Korean peninsula and while the main ingredients are basically the same, tuna, saury and pork are often added. And you can just as easily omit them! Koreans eat kimchi jjigae all the year around but for westerners used to dreary, dark, grey winters, this stew would be considered a seasonal companion. As with other foods which stew cabbage kimchi, the older the kimchi the better. You can use fresh kimchi but the taste is far richer and with a greater depth if your kimchi is nice and sour. Like many similar Korean foods, the recipe is very adaptable and you can easily jiggle it about and experiment. This recipe uses shepherd’s purse which while in Korea is probably classified as a herb, in the UK, is most definitely an irksome weed – especially if you are into lawns. Shepherd’s purse has quite an amazing taste and a small amount can transform kimchi jjigae into another dish. If you were to add the same amount of parsley to jjigae the effect would not be as marked as to warrant including ‘parsley’ in the recipe title. Pork, any cut about the size of a large dice though you can add more. Chop into small pieces. Conversely, you can leave it out altogether. 1 cube (4 cloves) of crushed garlic. Shepherd’s purse (냉이) about a third of a cup. 2. Put the pork in the marinade and leave from two hours or overnight. 6. Bring to boil, allowing it to vigorously boil for five minutes and then simmer on a low heat for 30 mins. Top up with extra water to maintain original amount. 7. Remove from the heat, garnish with sesame seeds and serve. Serve with an accompanying bowl of rice. Naengi is awesome, but isn’t it usually consumed in spring? I keep it in the freezer throughout the year. Kimchi is my least favorite Korean food.